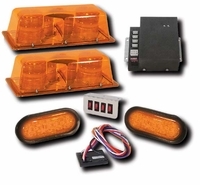 Our LED and Strobe warning light kits are quality attention getting power that is built to last. The LEDs are not susceptible to shock vibration and are designed to last 1000,000 hours, that's 10 years! Combined kits with strobes will add a versatile, high powered 24 to 70 watts of power right where you need it. Choose from oval or 4" round LED lightheads and single or dual head strobe heads. All kits include cables with attached ends for strobe heads and a pre-wired switch panel.